I always recommend my blog readers to invest in direct funds over regular funds and you can read about the comparison of direct vs regular funds here. The last fiscal I didn’t go for a direct option for my tax saving scheme but this year I decided to go for what I preach. This fiscal I am set to go with the my choice of best tax saving fund of 2017 which is DSP Blackrock Tax Saver Fund. 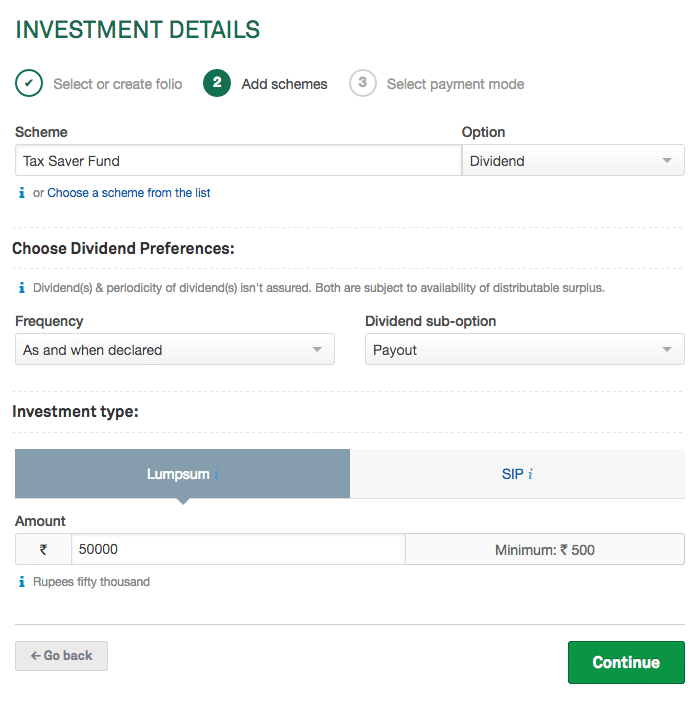 As you may know by now, I will go with the dividend option for the my tax saving. Zerodha is one of my preferred broker and recommend them as well. Zerodha recently launched a new platform called COIN where investor can invest in direct mutual funds. I was also surprised by it because broking is a business and they need money to survive. Allowing investment in direct funds can mean revenue loss. So investment in direct funds by brokers is almost impossible. 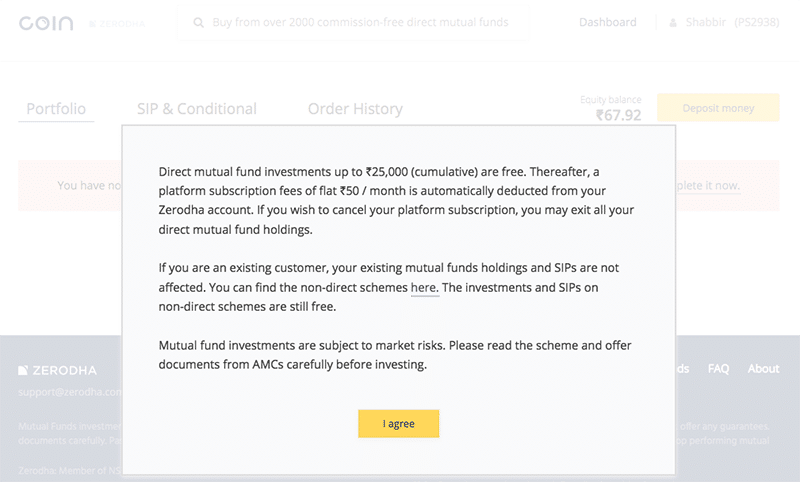 So COIN by Zerodha allows investment in direct funds, but it has a monthly charge which even exceeds regular mutual fund charges unless your portfolio is sizable. 50 Rs. per month or 600Rs per year. 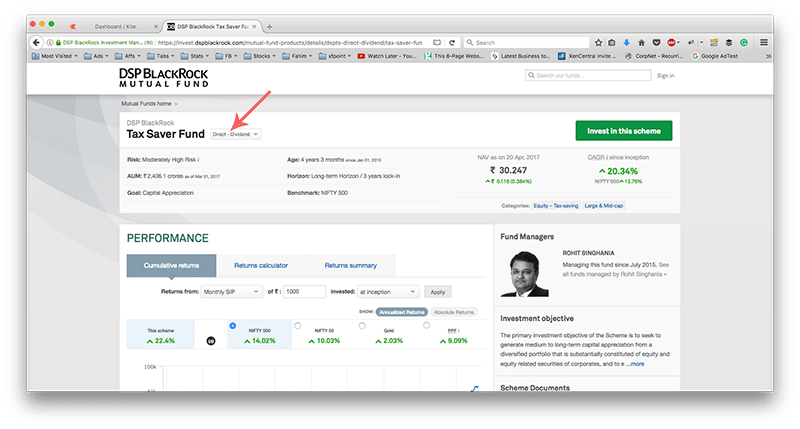 Normally the expense ratio of the direct fund and regular fund carries by 1% to 1.5% and so unless the mutual fund portfolio is above 90,000, it makes no sense to be using COIN by Zerodha. Is Direct Investment That Tough? I had so many questions in my inbox about this new platform by Zerodha (which should be avoided) and queries about how one can invest in direct funds. So let me show a step by step process of how anyone can invest in a direct fund. 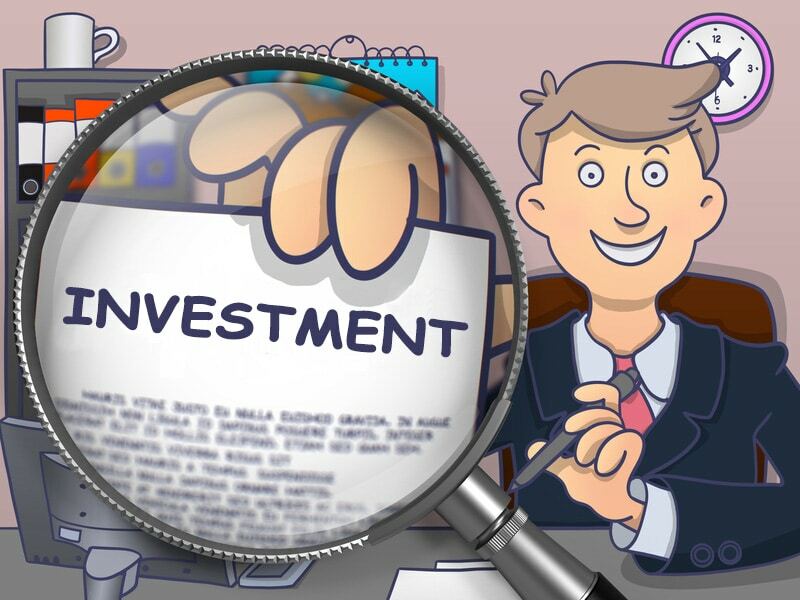 Investing in direct fund is simple and I will share how I did an investment in direct fund in few minutes. Though I will be investing in the DSP BlackRock Tax Saver Fund. The process should be fairly similar for other funds as well. Google the name of the fund you wish to invest and visit the fund’s official site. Normally Google will show you the fund’s details page from the official site. 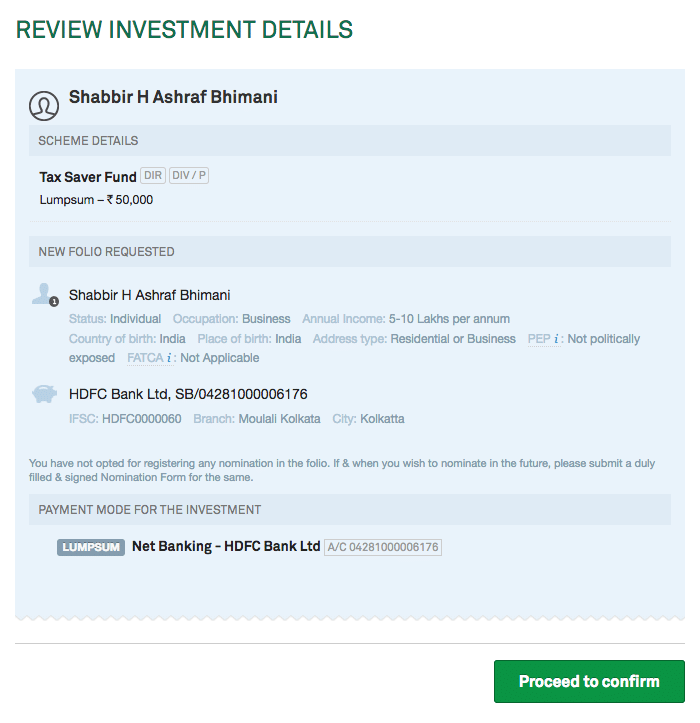 You can invest in the regular fund option from the fund house site as well. So make sure you have the right option selected. Proceed to invest and you will need to verify the KYC Details. 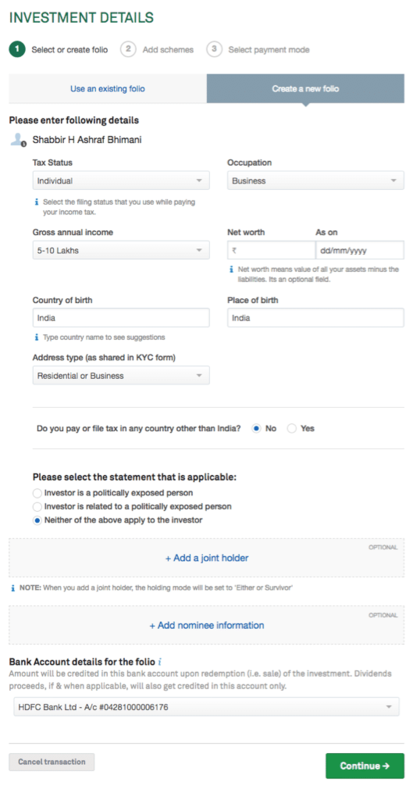 If your KYC is incomplete, see how you can get your KYC done. Enter the PAN number and Date of Birth to proceed. 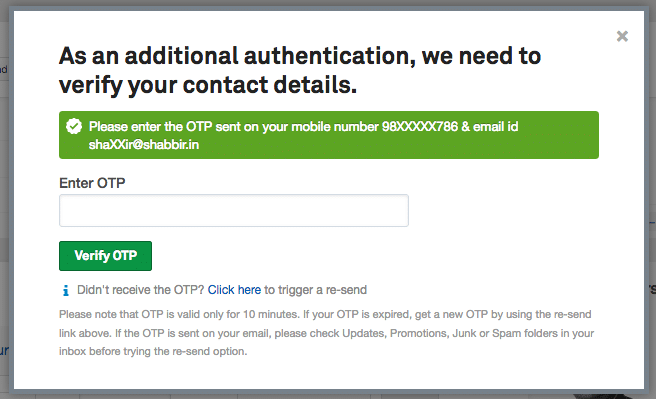 Once KYC is verified, you will be sent an OTP to verify your contact details. Enter the OTP to proceed. Once OTP is verified, all your investment in the existing fund will be displayed. Last year I invested in the same but regular fund 5 times for my tax saving. I like to create a new folio with each amount invested because it helps me deal with the lock-in period in an efficient manner. I can withdraw the folio units as and when I want after they complete the lock-in period of 3 years. 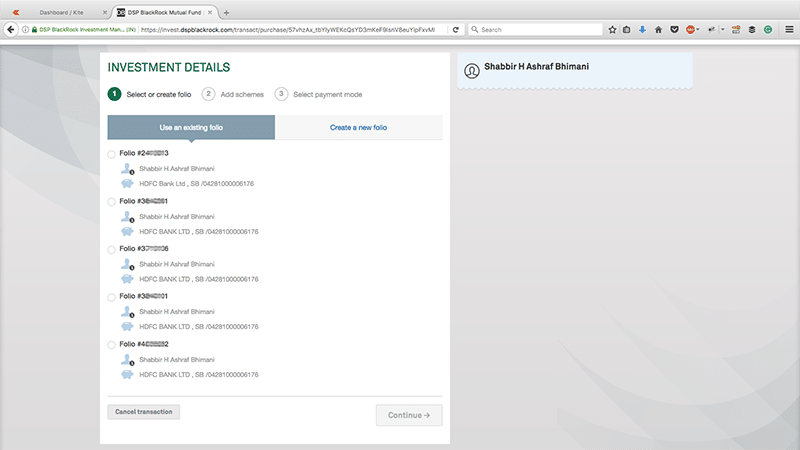 Fill out few personal details and add bank details for dividend payout and withdrawals. Fill the amount you wish to invest and continue. I am investing 50k like I did with my open portfolio. 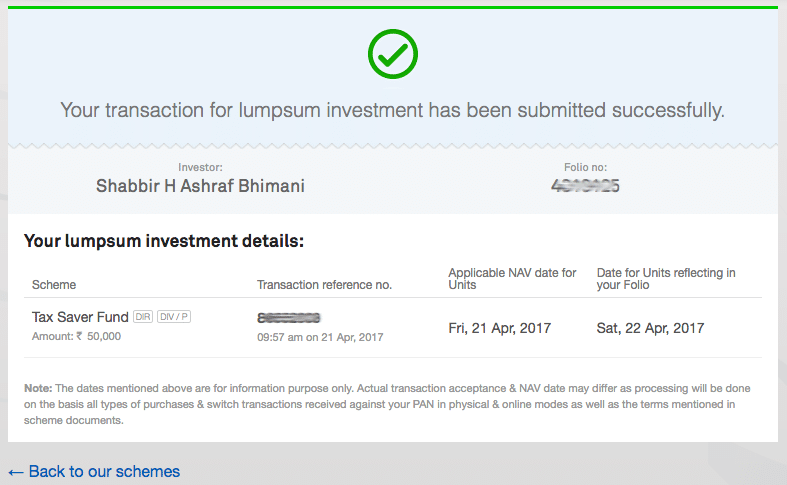 Because I selected a lump sum investment, it offers me to add SIP. If you prefer doing a SIP along with lump sum, you can add extra SIP to the same order. I prefer lump sum investment spread over a time for my tax saving. 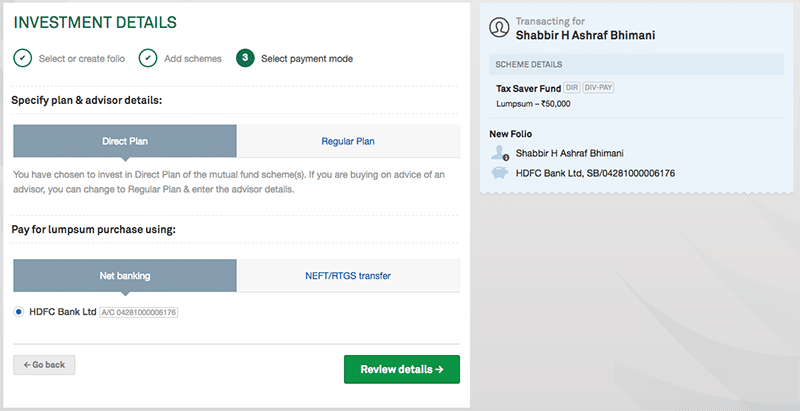 Make sure we have direct plan selected and for payments, you can pay through net banking option but can even do an NEFT payment to the fund’s bank details. 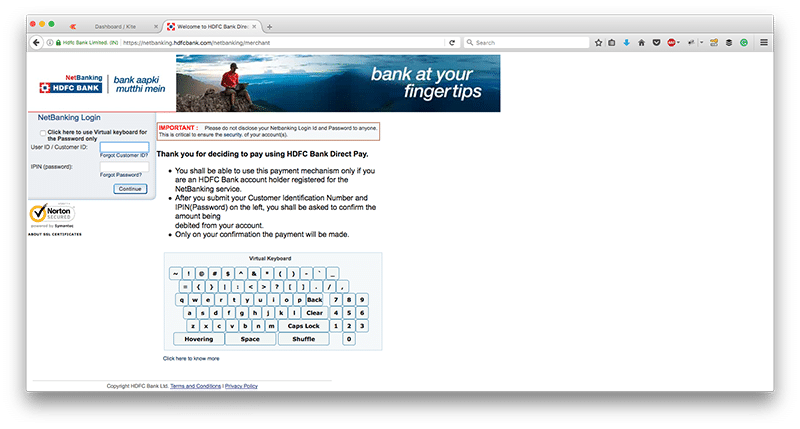 I will opt for net banking payment option. Review all the details entered and proceed to make the payment. 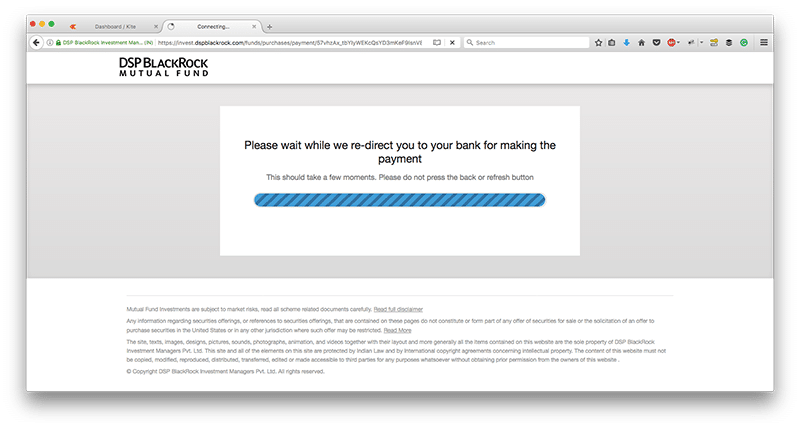 Sends you to your bank’s payment interface. Make the payment and once done you are back to DSP Blackrock site. Please be patience as the above step took slightly long time for me to complete. Once done you will see the confirmation message with a folio number. Note: The confirmation is of the order submitted and you aren’t allocated any units yet. You will get another SMS / Email once the units are allocated in your folio. This is so simple process that I don’t see any reason for anybody to be selecting regular funds these days including me.